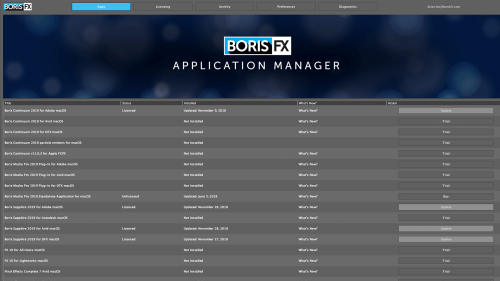 The new free Boris FX Application Manager makes it easy and convenient for users to manage all Boris FX applications within one streamlined tool. The Application Manager offers many long-requested features and newly expanded functionality, including deactivation and reactivation for any installed Boris FX product (without needing to fully uninstall), quickly updating currently installed software to the latest versions, and a simple way to install trials of any Boris FX product. After a user installs the Application Manager on a workstation, it will automatically scan for any Boris FX applications and licenses. You’ll also see which Boris FX products have been installed and whether there is an associated license currently being used to run the installed product. 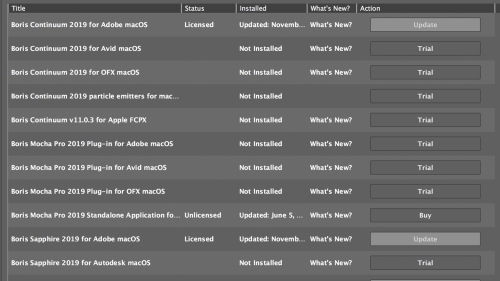 No more wondering which Boris FX applications and versions you’re currently running, what license type you have or when your annual subscription ends. It’s all in one handy place. Need to move one license between multiple workstations? Now you can! 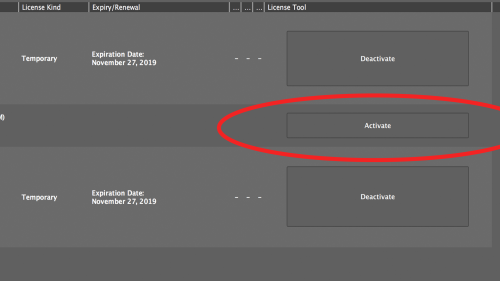 Simply click the “deactivate” button under the “licensing” tab to release the currently installed license and make it available for a separate activation. Interested in trying out a new Boris FX plugin? A trial version of any of our software is accessible from the “Apps” tab and can be downloaded with one click. 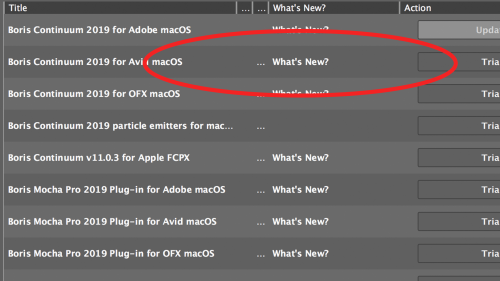 It’s easy to stay current with the latest product releases thanks to the Boris FX Application Manager. The “Apps” tab allows users to quickly review which version of each product is installed and if any new versions are available. Download the updates and install instantly. 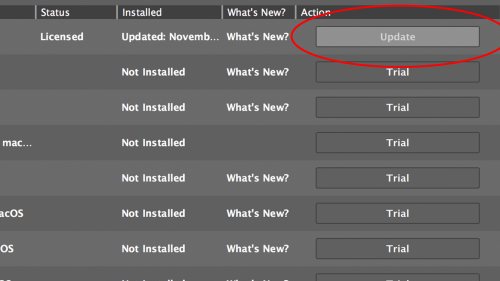 Find the most recent release notes for all Boris FX products by clicking the “What’s New” link. A great way to catch up on all the new features and improvements in every product release. Boris FX support may occasionally need access to some internal documents to troubleshoot any sort of support issue. 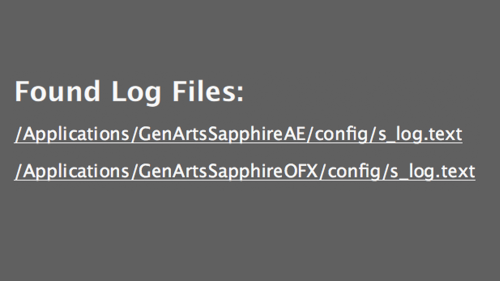 These internal logs and support files are now easily accessed under the “Diagnostics” tab. Do I need to have internet access to use the Application Manager? For the best experience, yes, your workstation should be connected to the Internet so the Application Manager can connect to the Boris FX servers and verify licensing. I have an older version of a Boris FX product, will it work with Application Manager? We strongly encourage everyone to upgrade to the latest 2019 versions of all products if you want to use the Application Manager. While some older versions of Boris FX plugins may work with the Application Manager, we cannot guarantee they will work, and only fully support the 2019 product lineup. Will the Application Manager work with a floating license? The Application Manager will display the total number of activations for an installed floating license. Boris FX floating licenses cannot be activated or released via the Application Manager. Can I move a Sapphire license between workstations without the whole uninstall/reinstall process with the Boris FX Applicaton Manager? Yes! Solving this problem was one of the main reasons the App Manager was created, and we are happy to offer this new functionality to Sapphire customers and an easier, simpler, and more intuitive workflow for Mocha and Continuum customers. Why am I seeing all those Boris FX products that I don’t use? Can I just show what I have installed? Yes, under the “Preferences” tab, check “Show Installed Apps Only”. because the App Manager has trouble connecting over wifi on Win 10, the software will display a “connecting” message instead of the live image feed from our servers. The only way around this is to use a hardware connection to the net.